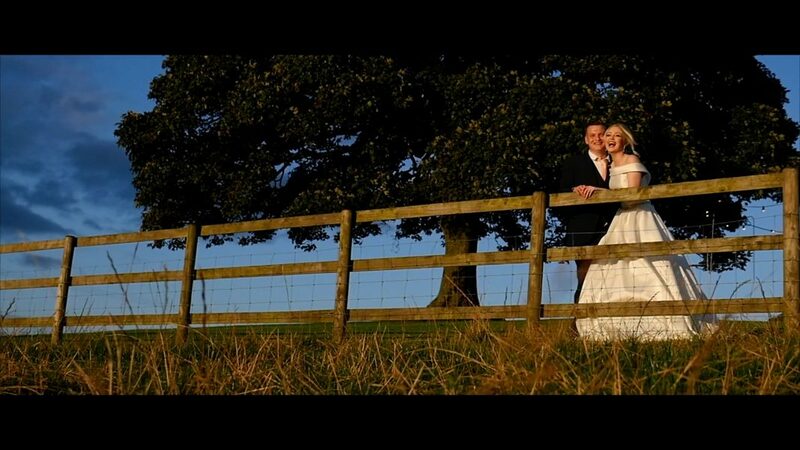 Heaton House Farm is a stunning country wedding venue nestled on the hillside of a working farm. I have filmed many wedding’s here and was particularly excited to film this event as the Bride and Groom were from my hometown in Cheshire. Lea and Joe had many fun ideas for their big day and did not disappoint. Lea, along with her bridesmaids and flower girls got ready in the bridal prep room at Heaton House Farm. Lea looked beautiful in her off the shoulder Champagne wedding dress. When the Mother & Father of the bride saw Lea for the first time in her bridal gown they were taken back with so much emotion. It was a spectacular moment to capture. Joe, his groomsmen and the guests cruised up the sweeping driveway to the stunning rural wedding location. Lea and her girls then made their way over to the wedding ceremony which was to take place in the cosy oak beamed barn. With its handcrafted sandstone walls and hand carved Green Oak ceiling beams dressed in twinkly fairy lights not to mention the unforgettable countryside views setting the backdrop, it was sure to be a beautiful, picturesque ceremony. After the wedding ceremony the guests headed outside to toss confetti over the newlyweds. They enjoyed their reception drinks whilst taking in the spectacular views of the Cheshire and Staffordshire countryside. The Flower girls and other kids had fun burning off some energy on the white wedding bouncy castle which later proved popular with the Groomsmen once a few of the reception drinks had kicked in. The Bride and Groom took a moment out in the private water gardens to have their photographs taken along with their little dog who made the guest-list, before heading over to Steele Barn to indulge in the wedding breakfast. Their entrance, which saw them rocking into the room complete with inflatable guitar’s and microphones was in keep with their fun personalities. The big day continued with the speeches as well as an emotional yet hilarious poem from the Mother of Bride. The cake was cut and now it was time for the party to start in Heaton House Farm’s wonderful wedding barn. The bride and groom kicked started the evening with their first dance under the rainbow lit ceiling, with bubbles cascading down onto them they slow danced away to Ed Sheeran’s Perfect before getting the guests up to join them on the dance floor. The whole day was truly amazing and I couldn’t wait to get the film into the edit suite. If you are looking for a wedding videographer at Heaton House Farm, or any other wedding venue, then please get in touch to see if we are available on your date.